26/02/2019 13:50Posted by Rayven26/02/2019 13:24Posted by SheercoldBtw Illidan used to discard 3 cards from each player as a battlecry.Oh yeah, I'd forgotten about that. Ironically his original design would actually be way more useful in the current game than what they changed him to.Well, back then there was not a single game mechanic to reward discarding, it was a cloned Overload pretty much - randomised cost for playing OP, undercosted cards. whats that?! 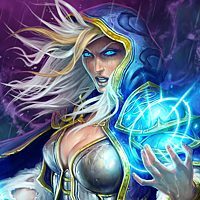 is hearthstone dying? I think your tinfoil hat broke, mate. Must admit that the ammount of trolling you've achieved in this pointless post necroing is amazing. Cya. No magnetic when seven creatures on board? 19/02/2019 13:50Posted by Toadim not 100% sure but i think its basicly playing a minion which then merges with the other oneExactly thatMagnetic is form of battlecry, and takes effect after minion touches the board.What OP actually asks is:Why I can't play 8th minion on the board, when there is a 7 minion limitAnd has his answer in his question8th minion7 minions limit.